Some of the links in this post are from our sponsors. We provide you with accurate, reliable information. Learn more about how we make money and select our advertising partners. Ask anyone the best way to save money, and they’ll probably tell you, “eat at home.” Buying lunch at work adds up every day, and taking the family out to eat can be scary once the bill arrives. But cooking at home isn’t always easy. If you’re short on time, feeding family members with special dietary needs like gluten-free or diabetic, or just bored with your go-to recipe, you might find yourself avoiding the kitchen altogether. I’ve found a few free cookbooks to help you change that. These PDF guides are completely free (except for the third one on the list, which charges $1 shipping), and are easy to download onto your computer or tablet. And you won’t have to call grocery stores to find special ingredients — all of these cookbooks use typical ingredients you can find in a snap at your local grocery chain. Here are nine ways to get your hands on free recipes, so you can cook up something new tonight! Most dishes have quick, simple recipes, with ingredient lists that won’t have you running all over town. And if you’re feeling ambitious, flip to the back of this free PDF guide for instructions for making your own pasta and dumplings. How about a new recipe for each day of this three-week plan? From pizza bites to smoothies to spinach casserole, these recipes are simple and and tasty — regardless of your dietary needs. The plan is perfect for printing, and includes space to keep a food journal about the things you make and eat. You’ll need to provide an address and phone number, and answer a survey about your health. But in return, you’ll not only get free recipes; you’ll also be able to get your hands on some coupons and discount programs. I’m not going to make any health guarantees about these recipes, but they will be very sweet! This one requires that you sign up for one of those free trials, but not only will they send you a Disney cookbook, they’ll also send you a Mickey Mouse cookie cutter and a set of cupcake stencils ($1 for shipping). The recipes include tips about how to involve kids in the baking process, even if they’re too young to work the oven. If your family has a birthday party on the horizon, this is a must-have! Sign up for Tablespoon to get access to tons of free recipes and coupons for General Mills products. The spring freebie is great all-year round and includes ideas for brunch, occasions like baby and bridal showers, or a simple weekday cookout. When you sign up, you’ll also get “Top 40 Rainbow Recipes” delivered to your inbox, for those days when you just need more color in your menu. It’s easy to download this book of spring-and-summer recipes, a must-have for families with a Celiac sufferer. You get five recipes, including some yummy dessert options. Provided by the National Foundation for Celiac Awareness, Celiac Central’s resources include a long list of gluten-free food bloggers for even more ideas. Eating Well also offers free email newsletters packed with recipes and tips, and you’ll get a chance to sign up for your favorites when you download the cookbook. Like to set it and forget it? This one’s for you, king of the Crock Pot. From roasts to stews to sides, most of these recipes have just three steps — or fewer! Sign up for the Mr. Food’s Test Kitchen “Quick & Easy” Everyday Cooking newsletter to download this collection. This PDF is massive, with more than 120 pages of recipes, ingredient guides and cooking shortcuts. It focuses on healthy eating, but many of the recipes add healthy extras like fruits and vegetables rather than taking away tasty ingredients. This cookbook doesn’t have many photos, but hey — there’s no pressure to make your plate look as perfect as the one in the book! Sign up for this popular food blog’s newsletter, and they’ll send you a free cookbook with 25 of their favorite recipes. With categories like “Whoa Salads” and “Lotsa Pasta,” it’s hard not to love this cheeky take on home cooking. There’s even a recipe that dresses up instant noodles to look (and taste) like they came from a restaurant. But wait! There’s more. Three weeks after getting this first freebie by email, you get the previous year’s top 25 recipes. Fire up the stovetop! 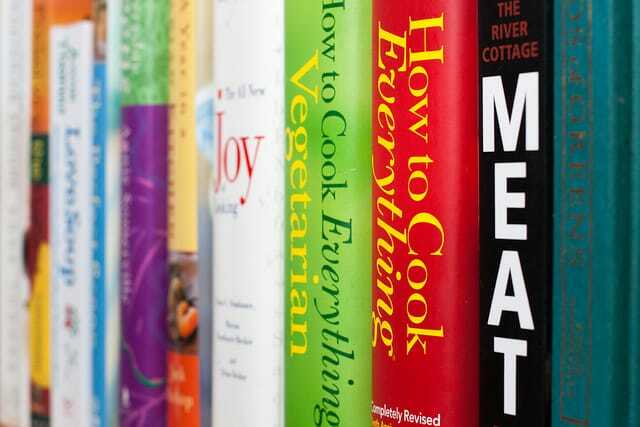 Your Turn: Know of any more free cookbooks we should get our hands on?